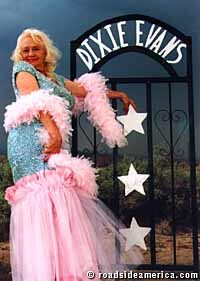 Sad news: Dixie Evans passed away on August 3, 2013, in Las Vegas. 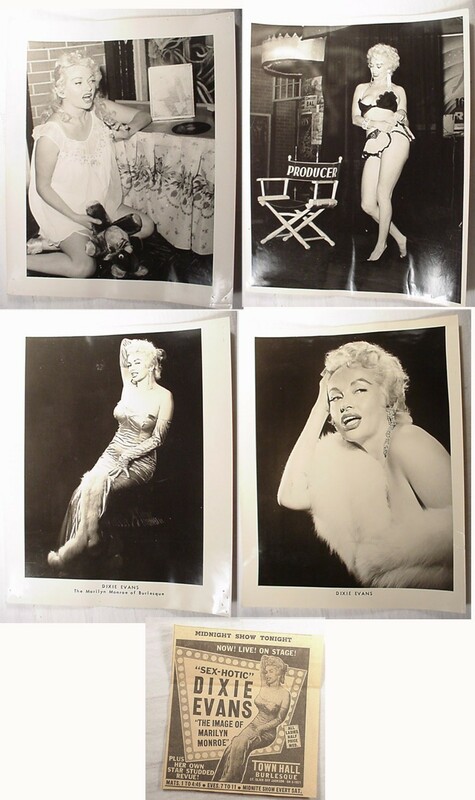 Long Beach native Dixie Evans emphasized the tease in her striptease act imitating Marilyn Monroe. She later ran a burlesque museum and remained a tireless promoter of the art. Photos from my archives, with newspaper ad. Java’s Bachelor Pad’s page on Dixie, with pix. Roadside America’s page on Dixie, and Exotic World, with pix of Dixie. She’s in “Best of Burlesque” DVD available on Amazon. According to an article in the Las Vegas Sun newspaper, Dixie’s painted plaster bust was one of the sculptural busts of stars of the bump and grind that were on display in “Breast Defense: Glamour Girls for Early Detection” at the Fallout Gallery on Commerce Street, Las Vegas, for 2008’s Exotic World weekend.